Quality shiplap building, perfect for storage or as a general garden shed. Available with a choice of either a 3mm window or a security window. Constructed using sturdy 50mm x 50mm frames and 12mm tongue and groove shiplap cladding. All sheds are pre-treated with a Golden Brown Protek water based treatment and should receive further treatment annually. Our shiplap wooden garden sheds have a 12mm thick outer cladding which is treated to help preserve the condition of the wood. This allows us to supply all shiplap wooden garden sheds with a 5 year manufacturer's guarantee. Although we supply these sheds with standard, uncoated flooring, it can also be tanalised at a small extra cost. Our entire range of shiplap wooden garden sheds are treated with a golden brown, Protek water based treatment which weather proofs the shed. 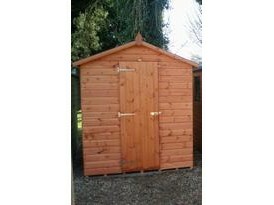 Wooden garden sheds should then be re-coated annually. Apex roofs are defined by their raised centre which slopes to either side of the shed. All ironwork included with our sheds is galvanised which provides permanent corrosion protection.